When you create something, aren't you proud of your work when you spend a lot of time and energy creating it? How about that social studies report you finally finished, that poem for your Mom that made her smile, that cool logo you came up with for your soccer team...? Well, all these are your creations and you'd probably be pretty upset if someone just copied any of them without your permission. That's where copyright comes in. I have not found any resources on copyright directed at kids below college level that support work reuse, collaboration, or sharing. (Argue with me if I've missed something.) Even in the copyright-questioning world of librarians, more radical copyright education is considered a grown-up subject. One: It's complicated - no, make that labyrinthine - and when we teach kids, we try to keep it simple. Two: Simple copyright lessons that try to discourage information reuse diverge utterly from reality. Savvy young users are immersed in mashups, remixes, parodies, and the glory that these can beget their creators. In today's popular information culture, one does not necessarily get "pretty upset", to use the language of CopyrightKids!, when one's work gets reused. One may actually get very, very happy. Of late, our government is steeped in culture change, represented by tools like CopyrightKids! In order to teach kids to understand today's copyright laws - or at least a conservative interpretation of them - these indoctrinating lessons first teach kids to feel differently about information sharing than the majority of them currently feel. It makes sense, then, that today's young information users are quickly growing jaded with the Copyright messages they've been fed, namely, NO, NO NO. If a guide to copyright is going to look at all like something to take seriously to young people, it's going to have to say YES - at least, a lot of the time. So, I created this presentation. Was that zoom-out impressive? I certainly thought so, which is why I reused it, from a genius animator named Balazs Turai who created it for the Prezi linked here. Is it cheeky to reuse such a large chunk of another creator's work, while setting an example for young people no less? Yes it is. But it's also within my rights. For this I thank the language expressed on the page hosting the original work, the Prezi application's collaborative features, and the wonderful world of Fair Use. This presentation isn't designed to be used on its own, but rather, to balance the conservative takes on copyright that are directed at kids currently. I also recommend using it in tandem it with at least a few of the American Library Association's Copyright Tools at http://www.ala.org/advocacy/copyright-tools. And while you're at it, why not talk about the purpose of copyright law? Artists and other creators do need copyright, on one hand, but at the same time all people - and nations - need to share information, for free, to grow and continue defining their own cultures. Copyright shouldn't protect one side of that balance, but the balance itself. Comments, questions, and attributed reuse welcome. If you'd like to read more background and context for this presentation, read the accompanying paper: http://copyright-yes.weebly.com/paper.html. Diane Daly is a doctoral student in the School of Information Resources and Library Science at the University of Arizona. YES YOU CAN Use that Copyrighted Work! by Diane Daly is licensed under a Creative Commons Attribution-NonCommercial-ShareAlike 3.0 United States License. We should note that the conservative views on copyright are not just aimed at kids. We are all exposed to the scare-tactics of various corporate and government groups trying to protect their "creations" for as much profit as they can get. You don't mention much about the Creative Commons licensing except the note at the end and in the picture. Why is this better than copyright? Does having a CC license hold up as well in court or in the eyes of the law? Is the trend to use CC or is copyright still the most common? Copyright is automatic - once you write down or otherwise an idea record in a fixed form such as an html page, Copyright law automatically kicks in to regulate the sharing and use of the work. 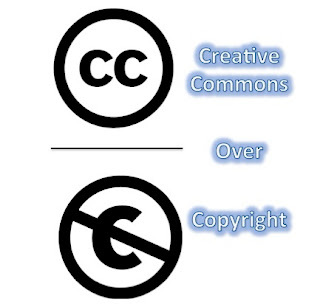 Creative Commons is an extra step some of us who create content online take voluntarily, because we are willing to have our work shared or reused - you as creator choose the license that reflects what types of reuse you are open to. When a creator appends a CC license to his or her creation online, he or she is saying they acknowledge the value of reuse and accept the type of reuse the chosen license permits. I don't know much about court challenges to it, but I do know that the world of reuse it has opened up absent of any legal challenge is enormous. Thanks for this! I teach, and this will actually be really useful to share with my students for their paper assignments.